Melina Schuh, at the Max Planck Institute for Biophysical Chemistry and former group leader in the LMB’s Cell Biology Division, has been awarded the EMBO Gold Medal. The EMBO Gold Medal is awarded annually to scientists under the age of forty for outstanding contributions to the life sciences in Europe. Young independent group leaders play a major role in building a strong research environment and EMBO places a focus on supporting the needs of young researchers at different stages of their careers. 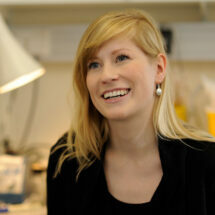 Much of the research on which Melina has been given the Medal was conducted whilst she was a group leader at the LMB. Melina’s research investigates how chromosome segregation errors arise during the meiotic divisions of mammalian eggs. This is of direct medical relevance as defects in eggs are the leading cause of pregnancy loss, several congenital diseases such as Down’s syndrome and the age-related decline in female fertility. During the early stages of her career, Melina established methods for high-resolution microscopy of live mouse oocytes, the progenitor cells of eggs, allowing in-depth intracellular studies of meiosis in mouse oocytes which had only been observed at very low resolution up to this point. In addition, Melina developed technology for high-content screens in mouse oocytes. Her lab then established methods that allowed them to carry out the first studies of meiosis in live human oocytes. Through this work, they determined the precise sequence of events that is involved in the formation of a fertilisable egg in humans, and identified steps in this process that are particularly error-prone. Melina’s work also shed light on why aneuploidy in eggs increases as women get older: chromosomes in human eggs disintegrate as women get older. This disintegration causes chromosomes to orient abnormally on the spindle and precludes their accurate separation. More recently, Melina’s lab, in collaboration with Dean Clift from Leo James’ group in the LMB’s PNAC Division, developed a new method for protein degradation – Trim-Away. This method is the first widely applicable protein degradation method that acts directly on the level of the endogenous protein. Melina is the sixth woman to receive the Medal since its inception in 1986. She follows in the footsteps of two other LMB alumni, Barbara Pearse and Sarah Teichmann, who have also been awarded the EMBO Gold Medal – meaning that half of the women who have won the Medal conducted their research at the LMB.